I’ve been on the lookout for some Christmas decorations this year, and when I saw these tiny Christmas tree ornaments, I was sold. 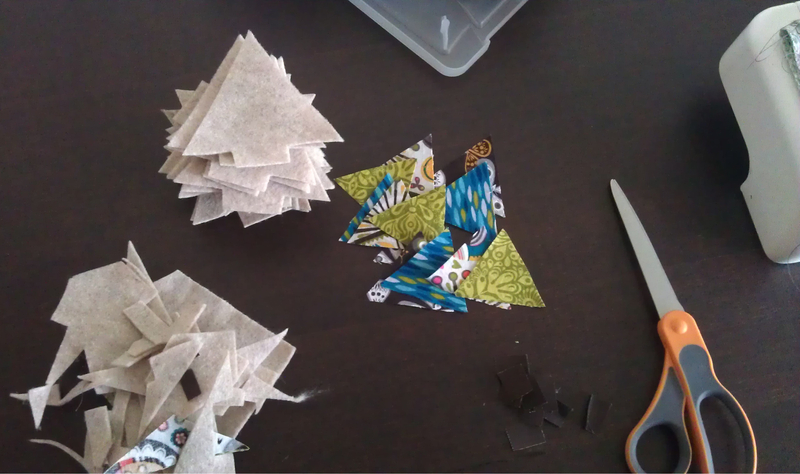 I have a ton of pieces of scrap fabric that feel too big to throw away, but too little to make any large projects with. But it’s all perfect for this! I purchased plain old acrylic felt, which is super cheap. Two 9×12″ sheets were enough for me to make 12 trees, which took just a couple of hours this afternoon. It is a very interruptible type of project, so it’s great for a day when you also need to run around doing laundry, or occasionally checking on something in the kitchen, etc. I sewed down three sides of the trunk, and then did the tree top. 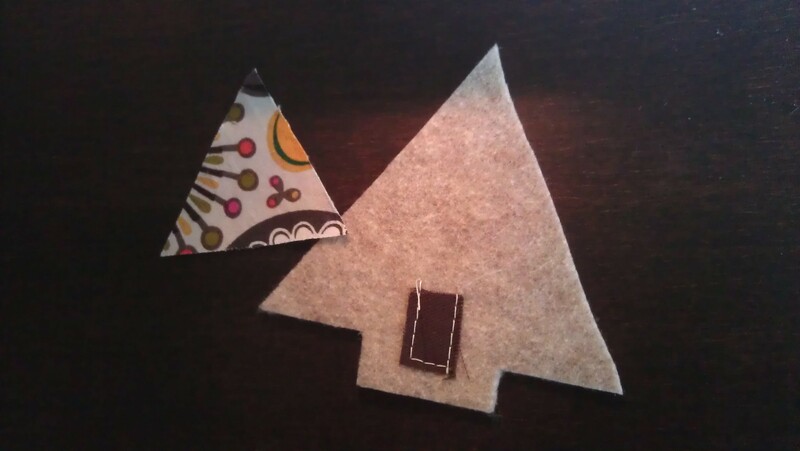 I didn’t glue the pieces together before sewing, the felt had a little bit of grip to it that held the fabric in place. I also found it easiest to leave one entire side of the tree open for stuffing – I sewed down from the top point, around the trunk and then out to the bottom of the other side of the tree. 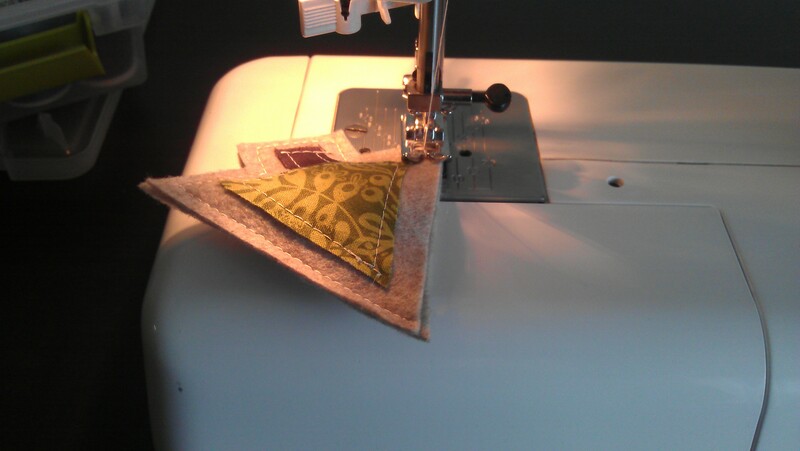 I used scraps of felt to stuff them rather than fiberfill – so if you don’t have any on hand, no need to purchase it! Pausing to stuff the tree. I put half of what I made on the garland, which is on my apartment door – I used some thin brown ribbon that I already had on hand, and sewed the tops of the trees directly to the ribbon. 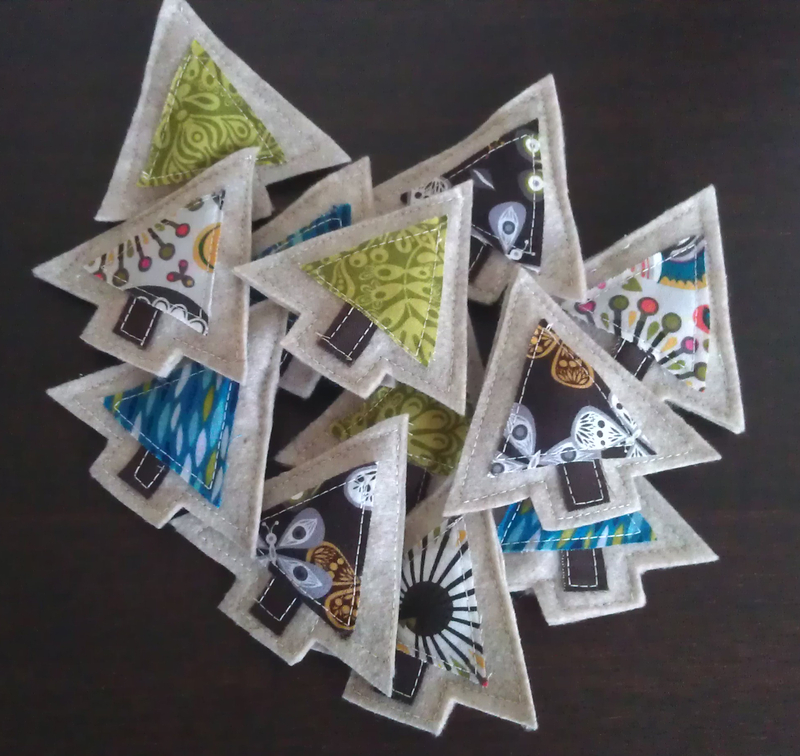 I also have six more that I made into ornaments, and plenty more felt. I have another holiday gift project to work on next, but I think I’ll be making a few more of these little trees because they were so easy!